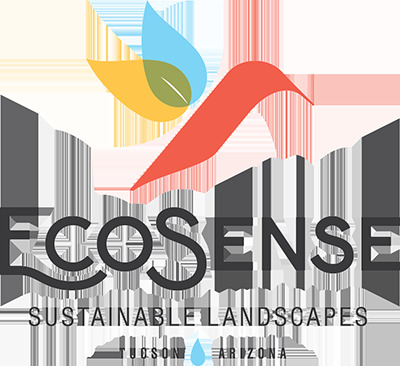 We strive to design, install, and maintain eco-friendly landscapes using native and arid-adapted plants that fit into the natural beauty of the Sonoran Desert. One of our favorite features of the Sonoran Desert is the fantastically diverse array of native plants. We celebrate this unique ecosystem by matching these rugged and beautiful plants with specific site conditions in which they’ll thrive. Sonoran Desert plant design can be smart, attractive, and responsible, and can save you money. Our landscape designs utilize native plants to meet a variety of goals, including providing year-round color and visual interest, building habitat structure for wildlife, supporting pollinators, creating edible landscapes, and developing privacy screening and shade. Native plants are an important part of creating and restoring habitat for pollinators and other wildlife species. By using a plant palette that consists of native and desert-adapted plants (supported by earthworks and rainwater harvesting), no supplemental irrigation is needed once the plants are established, saving you money and water. Native plants are adapted to our unique soil chemistry and rain cycles, setting you up for a successful landscape that maximizes beauty and minimizes maintenance and watering.